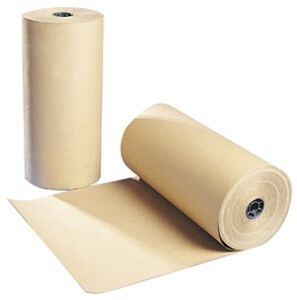 This paper is made from the Kraft pulping process utilizing Kraft pulp, yielding its natural brown color. Bleached Kraft Paper under goes a treatment using bleach and other formulas to produce that brilliant white you are familiar with. We can provide the total range of Kraft paper when working with you to define your project, all while giving you the option of having us hold Inventory for you. Below are the typical Kraft offerings most common seen. Please contact us for just a quick question or to discuss your new project - we are listening!! This technique produces an exceptional high gloss on one side of the paper. This allows for the ability to have an opacity, printability and superb combination of runnability. This provides a soft calendar which is often needed for superior print quality, convertibility and printability. Often used for reel wrapping, ream, carrier bags, form, and fill & seal applications. The most versatile in the Kraft family. Their high stiffness makes them perfect match for high-speed converting machines. This paper shows up in protective products, carrier bags, wrapping and PE laminated products. Used often as a hygiene release liner in the femcare and light adult incontinence markets. These are often developed for sterile medical packaging. Used in the direct sealing process for reels, pouches and FFS applications. Will also provide barrier properties in various wound and medical adhesive applications. Cheever has current customers that using these various papers. All of these papers adhere to FDA, International standards and main sterilization processes. Where Kraft papers offer high strength and superb consistence on the machine side, they are perfect for Coating and Laminating. Where there is very good dimensional stability and high stiffness, runnability is kept in check. With a wide range of basis weights and moisture profiles, mostly likely there is a product that we can fit for your project. Retail "brown bags" are not going away any time soon. There light weight to strength combination has been one of their main advantages. With white, brown, printed, MG (machine glazed), grease resistance or even ribbed, there is a "Brown Bag" that will fit your project.